Option A includes a 4" x 6" Aura Photo of your smiling face, a representation of your chakras, and a snapshot of your aura/chakra and bio-data graphs. Option B illustrates the representation of your chakras and bio-data and aura/chakra graphs in a larger format. comprehensive report featuring your color psychology profile. We also have a special, one-fold brochure report designed for wellness fairs and expos. 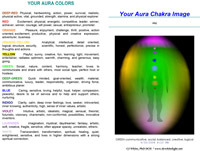 Your unique Aura and Chakra Image is printed on an informative,two sided, brochure that provides a brief explanation of the meaning of each chakra and aura colors. Your Aura Photo printed on 4" x 6" glossy photo paper. Brief description of basic Aura Color.